The Sunday talk shows are tilted in favor of conservative guests, a new study by the left-wing media watchdog FAIR asserts. Sunday morning shows are routinely raked over the coals for the lack of racial and ethnic diversity in the makeup of their guests. FAIR's latest study repeats another regular complaint: that the guests skew unacceptably conservative. FAIR looked at all of the guests on "Meet the Press," "This Week," "Face the Nation" and "Fox News Sunday" from June 2011 through February 2012. 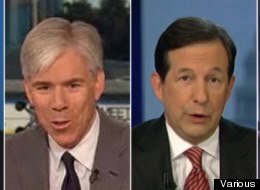 It found that 70 percent of the identifiably partisan one-on-one guests interviewed on the shows were Republicans. Roundtable guests were found to be similarly, if not as drastically, slanted. It's true that these statistics coincided with a very colorful Republican presidential primary season, with no Democratic contest to match it. But FAIR cited studies from a comparable period in 2003, when Democrats had all of the primary action. Those studies found that, even then, the guests leaned right. FAIR's Peter Hart wrote that the networks "would never say that they aim to provide a very narrow, very white and male, overwhelmingly conservative view of the world to their viewers every Sunday morning. But that's precisely what they do."